As a Chicago Teacher Education Pipeline (CTEP) partner school and a member of the Auburn Gresham Gold Neighborhood Network, Oliver S. Westcott Elementary is serious about rethinking public schools. Judging by the school’s Level 1 CPS School Quality Rating Policy score, Principal Monique Dockery and staff are on the right track. While teaching and learning is a priority, it’s the “public” part of the school that is changing how Chicago’s South Side community views Westcott. Guided by a vision of quality public schools as community access points, Westcott has committed itself to building strategic partnerships that target resources for students, families, and teachers. An example of its effort is seen in its partnership with the Greater Auburn Gresham Development Corporation (GAGDC). A major component of this relationship is the role community plays in education, and through professional development seminars, CTEP underscores the importance of parent engagement strategies to all incoming preservice teachers. “We believe that the best way to improve student prospects is to develop a set of holistic interventions that will provide a broad range of support to students and families, not simply within schools but across the community, using public-private partnerships, community members and institutions as the drivers of change” said Tenisha Jones, GAGDC director of education. GAGDC developed the parent room within Westcott to provide a space for parents to engage with workforce development services. This is a hub where parents can be involved in training that leads to an apprenticeship at a local CVS. The training includes resume writing, job searches, digital literacy, and healthy living workshops. Ciara Miller, GAGDC program manager, works with CVS Health to connect Westcott parents to career development opportunities and resources. Through the Children’s Literacy Initiative and GAGDC partnership, students can access intensive tutoring, and teachers receive coaching/training in the most effective practices for early literacy instruction. This two-generation strategy burns the proverbial candle at both ends by channeling support services to students, parents, and teachers. The synergy of these efforts has real consequences for the teaching and learning environment at Westcott. 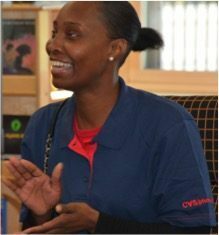 Dorcelle Johnson, Westcott parent room participant, now works with CVS Health. From a comprehensive perspective, parents who carry less-than-great memories of their own public school experience have an opportunity to reimagine their relationship with the institution. As CTEP prepares teacher candidates to become culturally competent and community-minded educators, GAGDC’s two-generation approach supports teachers in their pursuit to deliver a quality education to students. Helping parents change the trajectory of their employment opportunities and family quality of life is part of community development. Westcott’s parent room, Illinois State University’s CTEP collaboration, and the notion of community in education are the means to foster a public school environment where strong teachers are allowed to focus on teaching and learning.